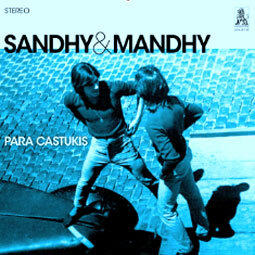 Here at last is a chance to discover why people have been willing to pay a very steep price to hear Sandhy & Mandhy, the duo who were not a duo, the band who were not a band, creators of perhaps the rarest and most expensive album from Argentina. To tell the story of Sandhy & Mandhy, we have to go back to 1967, when Alberto Infusino (Sandhy) and Alberto Vanasco (Mandhy) began their musical partnership in the beat band The New Free Men. Like many bands of that time, Los Shaker’s and Los Walkers, for example, the New Free Men played covers of songs by the Zombies, Animals, Kinks, Yardbirds, Doors, and so on, in clubs and at parties. Yet at the same time, Infusino and Vanasco started to play their own compositions, with a national touch to the music. Let’s let Vanasco (Mandhy) take up the story: “In 1969, we went to talk with Billy Bond, chief of ‘La Pesada del Rock Roll,’ to ask about the chance to make an album. Bond said that he was not looking for a band, but for a duo who sang songs in Spanish... So, we called some friends to play together, and we called the project Sandhy & Mandhy.” They recorded the album in three hours, with a full band (Farfisa organ, congas, drums, bass, and guitars)—one take of each song. Instead of a demo, they decided to press an LP: the company (Phonalex) pressed 110 LPs in total, which the band gave out at gigs. Sandhy & Mandhy were one of the first bands in South America bring a rebellious attitude to the music scene—all this in a period of military repression, when forced haircuts in the streets were a common occurrence. Although they broke new ground, success was not their fate. And so thirty-eight years after the burst of improvisation that was Sandhy & Mandhy, the rest of the world can finally take a taste of their dark, groovy, beat-influenced psychedelia (that fuzz guitar on the excellent ‘Lluvia’!). At times introspective and acoustic, at others manic and ramshackle in the best way, it’s quite a discovery. Now, on to the presentation—the highest quality mastering and pressing (done at Acoustech Mastering/RTI in California, the same people who master and press every title that audiophile label Classic Records makes); the resulting LP is housed in a poly-lined sleeve, inside an ultra-heavy 1960's style gatefold jacket, which is housed in a loose-fitting plastic sleeve. Inside the sleeve, you will find an insert with full details on Sandhy & Mandhy, including lyrics in Spanish and English, printed on 100% recycled paper. The LP labels are replicas of the originals. A top of the line pressing all the way. Limited edition of 800 copies. Το προϊόν αυτο προστέθηκε στον κατάλογό μας την Saturday 25 January, 2014.